Another 1st Birthday Cake! This time it’s a lion! The lion body is made from a 3D “lamb pan” turned lion. Fondant on baseboard, grass, face, tail and ears. Body is done in buttercream with chocolate buttercream for the mane and the end of the tail. Party hat is of course, an ice cream cone with some buttercream decorations. The birthday boy’s name is in Sparkle Gel. This little guy had to travel across Northwestern Wyoming and through Yellowstone Park to get to the party… and he didn’t have a good trip. We told everyone he was attacked and maimed by a Bear in Yellowstone – but yes, it was probably my driving that made his head fall off. Fortunately, we had a lion first aid kit with us, and his head was successfully re-attached before the party. So, if you make one of these and it has to travel – Secure The Head and Slow Down on the Curves… and Watch Out for Bears! 😉 The face was built out quite a bit with buttercream so I used “straw implants” to help keep it from sagging. Tail & ears took a long time to become solid enough so make them ahead of time! Also, something I learned… The grass was pretty sharp on the ends. We had to remove the grass before giving it to our 1 year old grandson so he didn’t hurt himself. 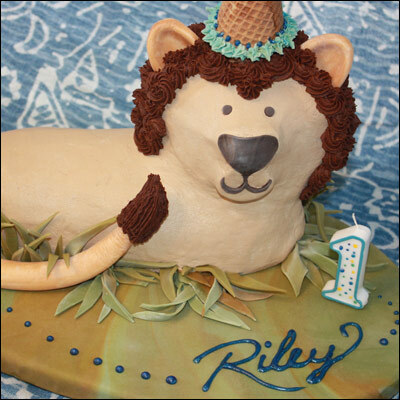 This entry was posted in CAKES & EDIBLES and tagged lion birthday cake, lion cake. Bookmark the permalink. You have such a great sense of humor and an wonderful talent for cakes! I love the baseball cake and am trying it for my son’s 2nd b-day party. He loves “b ball”! So glad I found your site and will check out your work in the future. Hey Michele, Thanks so much for the feedback! We have a lot of baseball fans in our family too! I should have given our grandson a little plastic bat to take to that baseball cake – he didn’t really want to touch it – so all the other kids did it for him. It was pretty funny. I’ve been having lots of great new ideas for kids cakes – just need some more birthdays to try them out! Thanks again! Hope your cake is a hit! How funny- here I am looking for lion cake inspiration and I see your picture and think “Hey that looks like the same lamb shape I’m going to use.” Sure enough, you have the same lamb cake pan as me. I made a dog last year- it was hideous, but hilarious. At least now I have a really good example of how to make a lion with the shape I’m working with. Thanks! Too funny. I never thought to use it for a dog. Great idea! Perfect! Just googled to see if someone else had thought to use the lamb cake for a lion. My girls are having a Narnia birthday party next week and they love my 3D cakes. Thanks for the advice on the fondant, too! I have used it before but it can definitely be tricky. I was going to just use buttercream for it all, but now I think I’ll make the ears and tail today from fondant. The party’s in 5 days, so they should have enough time to dry. Thanks again for posting this! A narnia birthday party – what a great idea! thanks so much for the feedback! always makes my day! I would love to see photos!! ha.. yes, we all need a good push from time to time, don’t we?!! can’t wait to see it! Here’s a link to Debbie’s very cool lion cake! 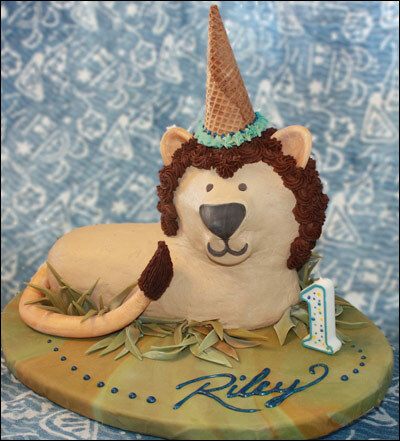 Here’s another 3d lion cake using a lamb pan that I see is linking to my blog! Thanks! Same concept – different style, check it out!